We want to welcome all our existing and new BizSugar sharing platform members and also new members to our new BizSugar Mastermind group. Important: The sharing platform and the Mastermind group are on two different platforms and use separate log in information. But don’t worry. We’ve prepared an easy guide to lead you through joining both communities, whether you’ve been a regular visitor to BizSugar in the past or not. If you’re a longtime contributor to the BizSugar sharing community, don’t worry. Not much has changed. The original BizSugar sharing platform has been moved to https://share.bizsugar.com/. This is where you share your content and find the best content shared by others. If you are already a member of the BizSugar sharing community, simply log in the way you always have. If you aren’t already in our sharing community, create an account by clicking “Register” in the top right corner of the page and fill in the form. Once you’ve joined, simply log in at the top right corner as shown in the image below. But whether you’re a longtime contributor to the BizSugar sharing community or are just joining, we’d love for you to join our BizSugar Mastermind Community too. And there are benefits for doing so. 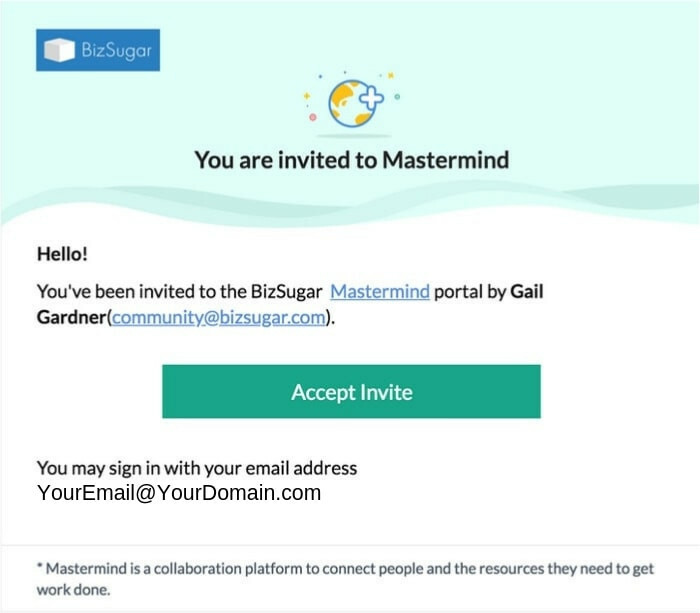 As mentioned, the BizSugar Mastermind community is a separate community hosted on Zoho Connect. 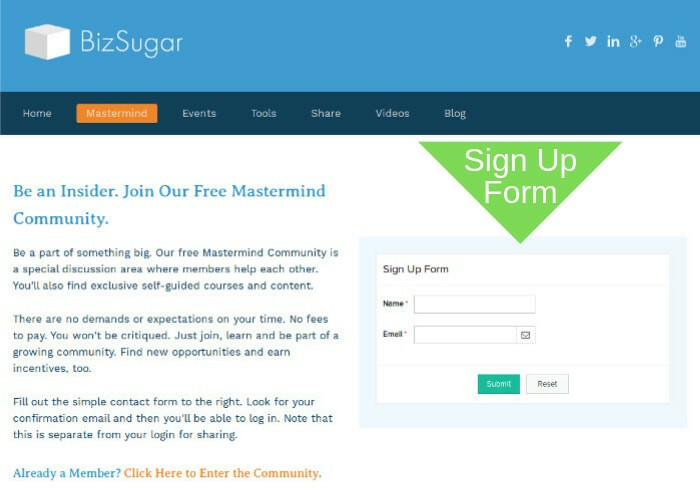 To become a member, go to https://www.bizsugar.com/mastermind or click on the Mastermind tab from the main BizSugar.com home page. If you don’t see that green message, don’t panic. Just leave a comment in this post for personal assistance and I or another member of the BizSugar team will contact you soon. Or contact me using one of the methods at the bottom of this post. 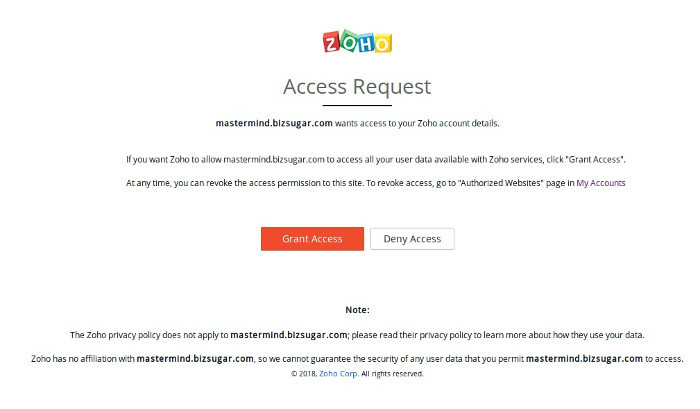 When you log into the BizSugar Mastermind community you will be logging into Zoho, too. Once you’ve signed up, Zoho will ask for permission to access your Zoho account details. Simply click the orange “Grant Access” button and you’re ready to log into the platform that hosts the community. In the future, if you are logged into Zoho you will be able to go directly to the Mastermind community without needing to log in again. 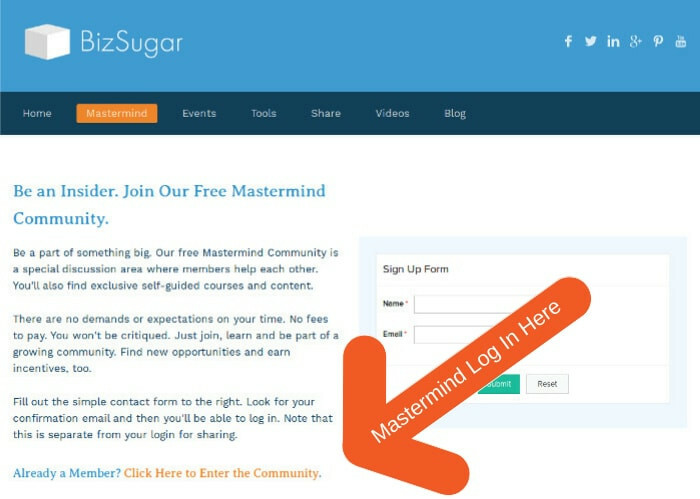 If you’re still confused about how to log into the BizSugar Mastermind community, here’s another brief overview. 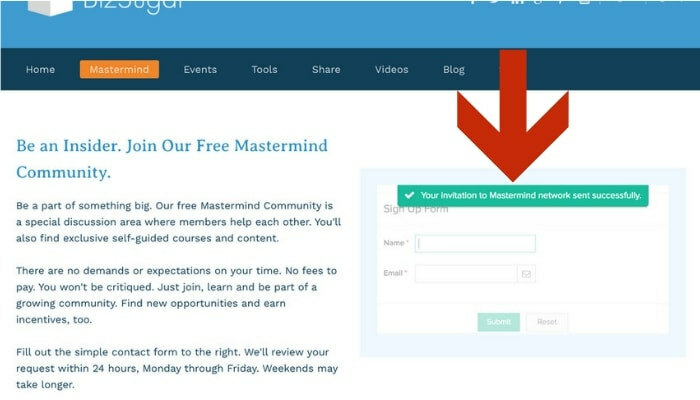 You can go there directly at http://mastermind.bizsugar.com/ or by clicking the “enter the community” buttons from the Mastermind tab or the main home page. If this is your only Zoho Community, you are now inside the group. But there is one more step to take to make sure you see all the tools and resources we will be sharing. These are tools like calculators, templates and scorecards to help run your business more efficiently. Click on “Groups” in the far left corner. Click “Public Groups” under “My Groups”. If you are a member of other groups in Zoho Connect, remember to use the drop-down at the top to switch between them. There will not be a drop-down arrow like the one shown in the image above if you are not in any other groups anywhere else. Need Assistance Joining or Logging In? Should you run into any challenges accessing or using our new community, please do not hesitate to reach out to me or any other member of the BizSugar team for help. You can send me a chat message inside the Mastermind group or — as mentioned earlier — leave me a comment in this post. In a hurry? Send me a connection request on Skype (username growmap) and ask me there. I will answer as soon as I see it. Don’t use Skype? Message me on LinkedIn.com/in/growmap or Facebook.com/growmap. Want to know more about the features and benefits of joining our BizSugar Mastermind community or find out about our calculators, tools, templates and scorecards to which our members will have access? Read our announcement post “Introducing the New BizSugar“. I am sure this will help a new person to join this amazing platform with much ease. Though I faced some problem in the beginning to get into this area, your relentless assistance helped me to be in. This is no doubt a great help to people like me. You made it in a very easy to follow tutorial. Wish all the new entrants a great time of interaction ahead. Congratulations. Well done on setting this up.. I love bizsugar but I haven’t been able to get in to share for an age! I have sent you emails etc but I just cannot get in.. please help or let me know when you’ll be addressing access issues..thanks. 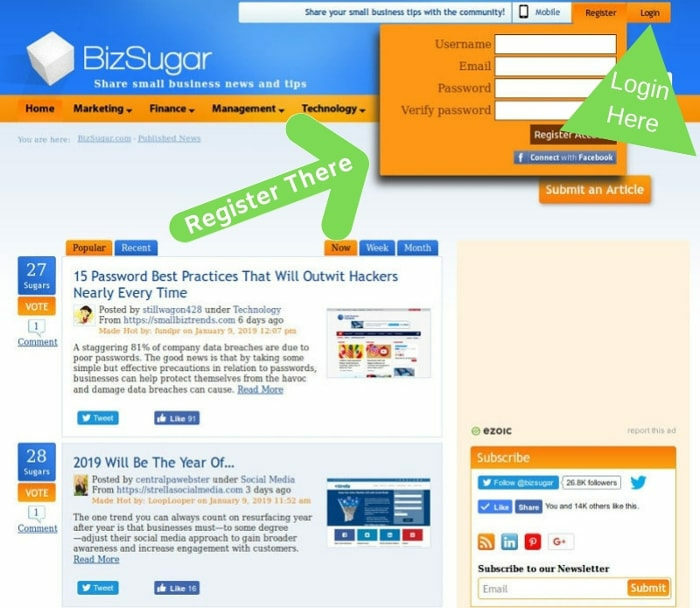 BizSugar look and feel completely changed…thanks for sharing how to log into bizsugar and mastermind group. I can assist you if you can describe what happens when you try to log in. Have you tried resetting your password? I will ask Shawn to look into why you can’t log in. Watch for an email from him, but it may be in a day or two. I have followed all the above mentioned steps to register my driving school Wellingborough business so can share stories and articles but can’t login? Any help with that. If you can give me more details I can try to assist you. What happens when you try to log in? Were you able to register? Do I have to pay per month as a member of BizSugar group ? or another payment when I register on this site? No, there is no charge for any part of BizSugar. Using the resources on the main site, the sharing platform and participating in the Mastermind Community are all totally free.